Bridges are sensitive structures. They are stressed by enormous forces, have to withstand heat and freezing cold, and are exposed to storms and even earthquakes. Often hidden behind steel and concrete is the fact that bridges have impressive interiors in order to deliver on their promises. And this is where bearing technology from Schaeffler comes into play. Around the globe, plain bearings, cylindrical roller or spherical roller bearings from Schaeffler ensure stability and durability in buildings, sports arenas and man-made lakes – or in bridges. Ever since antiquity these structures have not only been physically connecting urban neighborhoods, islands and countries, but always been bringing together people and cultures as well. 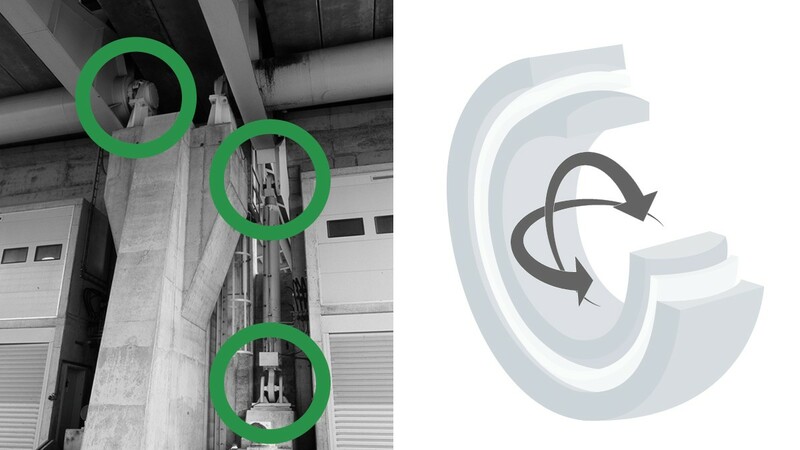 To limit the forces of dynamic motion up to and including earthquakes in bridges and other architectural structures, large-size shock absorbers are used as well. They are suspended from Schaeffler’s radial spherical plain bearings. These components combine the fortes of cylindrical plain bushes with the ability to compensate for swivel movements and tilting. Cylindrical plain bushes are particularly suitable for small swivel movements but permit axial motion as well. Consequently, they are practically predestined for applications such as those found in the upper suspensions of the supporting cables of cable-stayed (suspension) bridges. Plain bushes from Schaeffler have high dynamic load ratings, deliver long service life and require minimal or no maintenance. In contrast to the upper suspension points of the supporting cable, the lower mountings also have to be able to absorb the multi-directional pivotal movements emanating from the road. That’s why instead of the plain bushes used at the top the more agile radial spherical plain bearings from Schaeffler are used. Radial spherical rolling bearings are practically predestined for systems with a greater range of motion such as bascule and swing bridges, in which high radial loads occur in combination with axial loads. Featuring a clearly more compact design than other rolling bearings, they are extremely strong and withstand highest loads. Alternatively, the folding and swiveling elements can be equipped with radial spherical plain bearings. The hydraulic cylinders in bascule and swing bridges move extremely high loads. Radial spherical plain bearings with high dynamic load ratings and special coatings from Schaeffler ensure required agility and maximum actuator reliability – even in harshest ambient conditions. In addition, such radial spherical plain bearings can be installed in the folding and swiveling elements as an alternative to radial spherical rolling bearings. Fallen trees across rivers, eroded stone paths in creeks, or tropical plant fiber ropes crossing canyons – the first bridges were inspired by nature. In the wake of industrialization, the addition of concrete and steel opened up new opportunities to bridge builders all over the world. In many places, aluminum alloys and carbon fiber reinforced plastics are used today as well. In 2019, the first bridge from a 3D printer is planned to be opened in the Netherlands. Equally varied are the types of bridges that exist such as swing, bascule, rolling, draw, lift, suspension and cable-stayed bridges. When asked to name the city with the largest number of bridges in Europe most people are off the mark. To the amazement of many, the Hanseatic City of Hamburg has the largest number of bridges – some 2,500 of them – which is more than Venice and Amsterdam combined. It goes without saying that among existing bridges there are numerous masterful feats of engineering, joined by new ones such as the “Hong Kong-Zhuhai-Macau Bridge.” It is 55 kilometers long, built from 420,000 tons of steel, and thus the world’s longest sea crossing. The bridge connects Hong Kong and Macau to the Chinese mainland. This high-tech structure is said to withstand wind speeds of 200 km/h, 8.0-magnitude earthquakes and collisions with tankers and container ships of any size. Hardly less important is the near-50-kilometer bridge construction of the “Sheikh Jaber Al Ahmad Al Sabah Causeway” above the Kuwait Bay. This infrastructural behemoth is planned to be finished in 2019. Even longer, albeit mostly traversing land, is the “Danyang-Kunshan Grand Bridge.” 164 kilometers make it the longest bridge in world. It meanders along the Yangtze River, spanning rivers, canals, canyons, creeks, plains, hills, lakes and rice paddies for the Beijing-Shanghai High-Speed Railway. A single axial spherical bearing from Schaeffler supports the weight of 800 tons of the “Puente de la Mujer” in Buenos Aires. The operators of many bridges around the globe rely on large bearings from Schaeffler with high load ratings, low friction and the resulting reliability even in the most challenging environmental conditions. 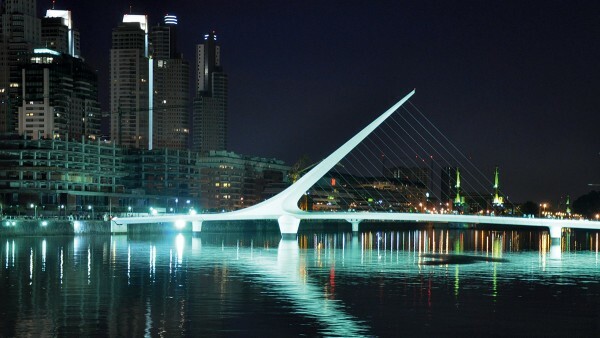 In the “Puente de la Mujer” rotating footbridge that has become a landmark of Argentina’s capital Buenos Aires, a single, maintenance-free axial spherical bearing supports the bridge’s entire weight of 800 tons. 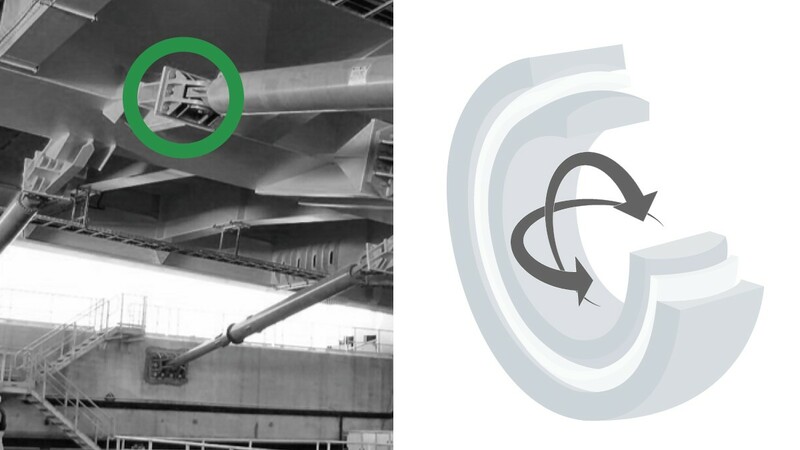 The four pivot points of the “Porta d'Europa” bascule bridge in the port of Barcelona rest in large spherical plain bearings from Schaeffler with 670-millimeter bores. With a span of 106 meters it is one of the world’s largest double-leaf bascule bridges. The twelve-lane “Van Brienenoord 2” freeway bascule bridge in Rotterdam, across which more than 250,000 vehicles travel per day, uses four spherical roller bearings. They have 850-millimeter bores. 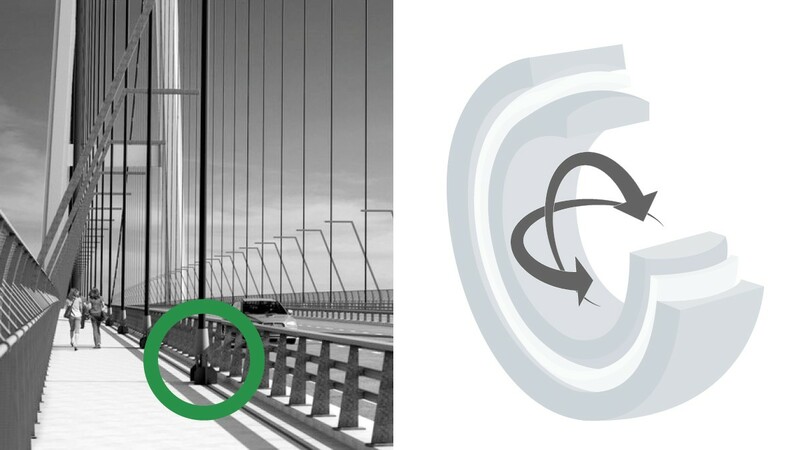 In the “Storebæltsbroen” bridge – one of the world’s longest suspension bridges with a length of 1,624 meters – between the Danish islands of Funen and Zealand, twelve spherical plain bearings from Schaeffler compensate for all oscillations caused by wind and traffic. In 2016, the “Osman-Gazi” bridge in Turkey was opened with support from Schaeffler. The all-steel bridge is located at a height of about 60 meters above the Sea of Marmara in the south of Istanbul. The area is regarded as particularly earthquake-prone, so the fourth-largest suspension bridge in the world had to be equipped with special technology that constantly withstands potential tremors, movements and stress. 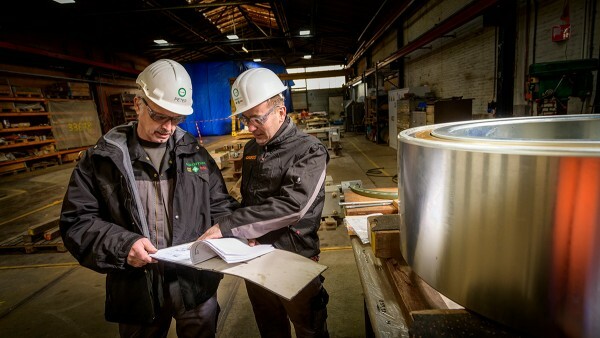 Schaeffler supplied 109 spherical plain bearings and 72 bushes for the areas in which individual bridge sections and bridge cables are connected to the foundation. In earthquake areas, buildings must withstand extreme forces. 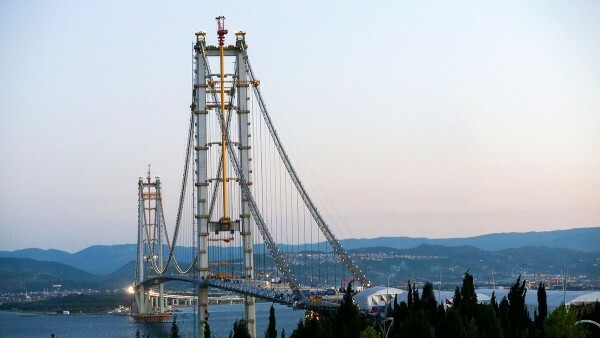 The Osman-Gazi bridge in Istanbul is securely connected by 109 spherical plain bearings and 72 bushes to the base, even in tremor situations. However, Schaeffler’s specialists are not only focused on new projects but on the rehabilitation or extension of existing bridges as well, such as the “Botlek” vertical lift bridge in Rotterdam, which has been decongesting the same-name tunnel with four additional freeway lanes since 2015. This bridge across the Maas River is regarded as one of truly mammoth proportions among lift bridges. Massive electric motors via cables raise the two center parts of the bridge within 109 seconds, 20 times a day. The bridge elements consist of some 10,000 tons of steel, concrete and asphalt – their weight is comparable to that of the Eiffel Tower. However, a year after the bridge was opened experts noticed strange noises and vibrations. The original bearings in the 67 pulleys for the counterweight cables were not able to withstand the loads – a challenge perfectly fitting Schaeffler. 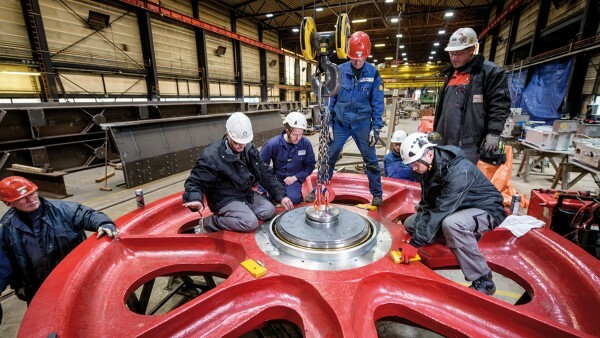 Peter Fischer, employee from Schaeffler’s plant in Schweinfurt, Germany (pictured left) and Gerard Versteeg, from Schaeffler Netherlands (pictured right) during the installation of the new bearings in the 67 pulleys of the “Botlek” vertical-lift bridge. Experts and Schaeffler engineers are mounting the double-row cylindrical roller bearings. 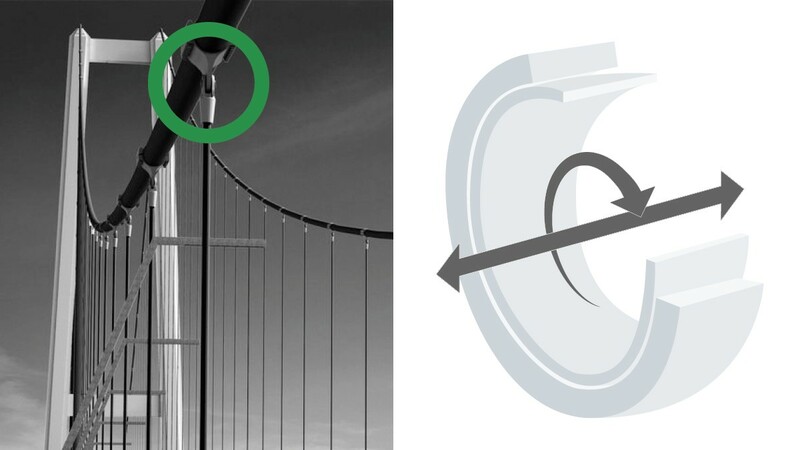 Using the Bearinx program, Schaeffler’s experts from Schweinfurt and Höchstadt were able to calculate the exact position and type of bearings that were necessary to handle the huge load of the movable bridge elements. Afterwards, every pulley was refitted with a specifically designed double-row cylindrical roller bearing, each with an outer diameter of nearly one meter and a weight of 800 kilograms. 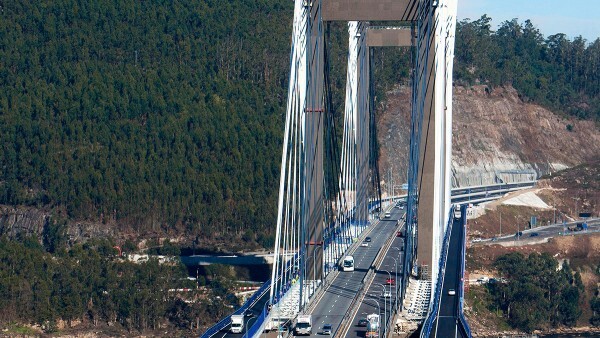 Schaeffler Iberia mounted 140 spherical plain bearings for the extension from four to six lanes of the “Puente de Rande” bridge in Galicia. Located some 2,000 kilometers south-west of Rotterdam is the “Puente de Rande,” a cable-stayed bridge that has been connecting the towns of Redondela and Moaña in the Spanish region of Galicia since 1981. With a length of 1,604 meters, a main span of 401 meters and two pillars with a height of 118.6 meters it was the first of its kind to be extended by two additional traffic lanes. Considering the surroundings and design characteristics, Schaeffler Iberia installed 140 maintenance-free spherical plain bearings with Elgoglide coatings. They ensure that the now six lanes and the bridge are securely held together while 50,000 vehicles travel across the bridge per day.